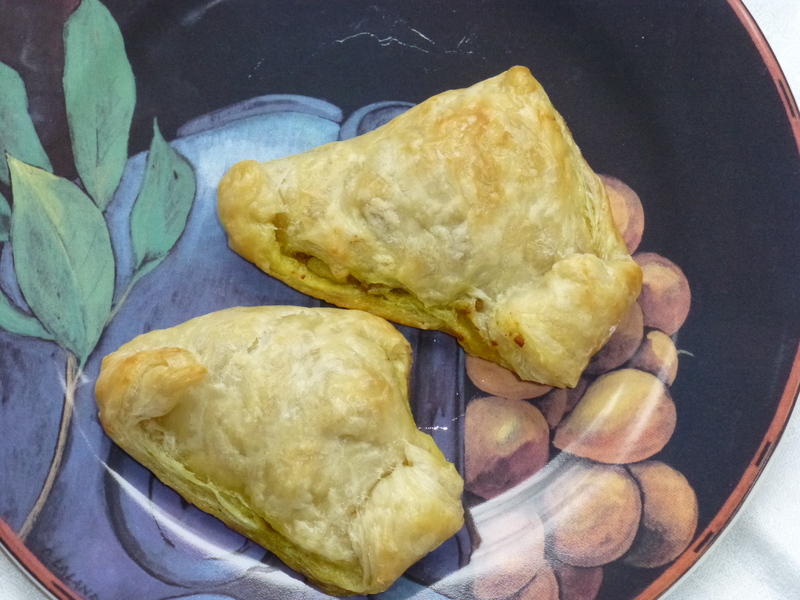 We cannot resist samosas when dining at an Indian restaurant and I wanted to try to make them at home. 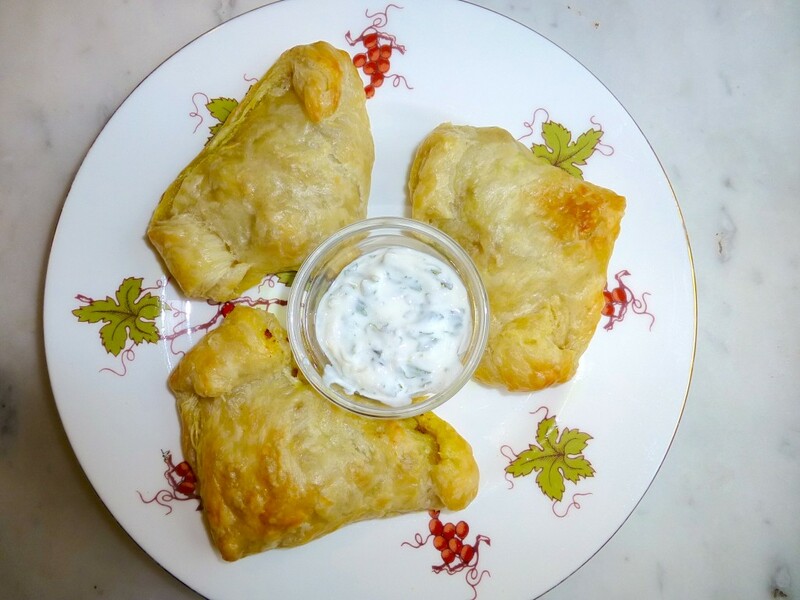 I wanted to find some acceptable shortcuts to the traditional Indian recipe as I was going to make these for New Year’s Eve appetizers to bring to a party and didn’t want to deep-fry. 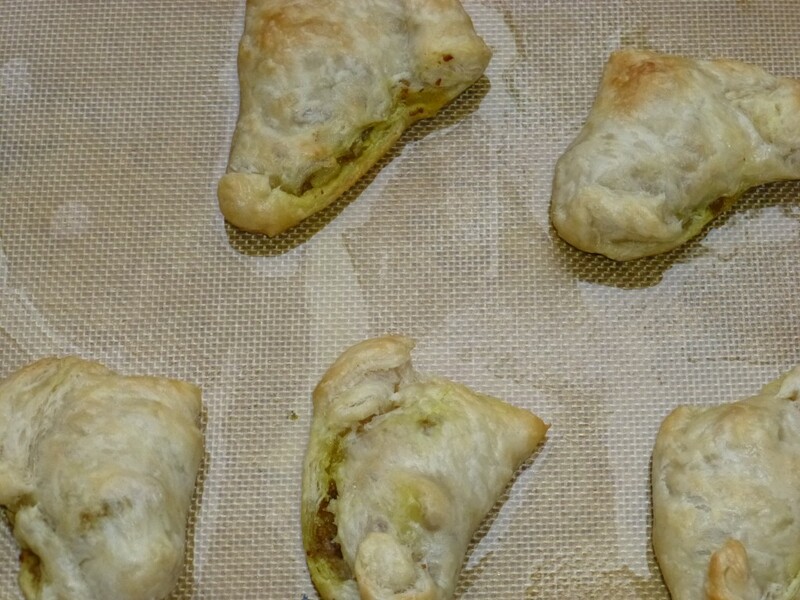 I adapted this Jean-Georges Vongerichten recipe for chicken samosas so that instead of deep-frying in spring roll wrappers I could use Trader Joe’s all-butter puff pastry and bake them. I simplified the spices to reflect what I had on hand and added potatoes sautéed in turmeric oil to give them some East Indian flair. I made them appetizer-size and I used ground turkey instead of chicken. I didn’t have whole cumin seeds to toast and grind, and didn’t have tamarind paste or diced tomatoes so I improvised. And I added garam masala to take them in a more Indian direction. Isn’t that annoying? I always want to reference a recipe that I start out with (out of respect, politeness, giving credit where credit is due), but I so often change, substitute, adapt, or improvise off the written script that the recipe is almost reinvented. Because the holidays were so busy and I was making a lot of consecutive dishes, I did this in steps over a couple of days so I would not lose my mind. But it is really easy enough to do all at once. Since I was taking them to a party in the neighborhood, I baked them and took them right over. They were good at room temperature. Awesome right out of the oven. Perfectly fine for my husband’s snack after errand-running, reheated in the toaster oven at 350°. Heat 2 T. oil in a large deep skillet over medium heat. Add the diced onion and cook, stirring, until translucent and softened, about 5 minutes. Add the ginger and garlic and cook until fragrant, 1 minute. Add the coriander, turmeric, cayenne, and ground cumin and cook, stirring, for 3 minutes. Add the ground turkey and cook, stirring, until the meat is completely cooked through (no pink) and broth has evaporated, about 7-8 minutes. 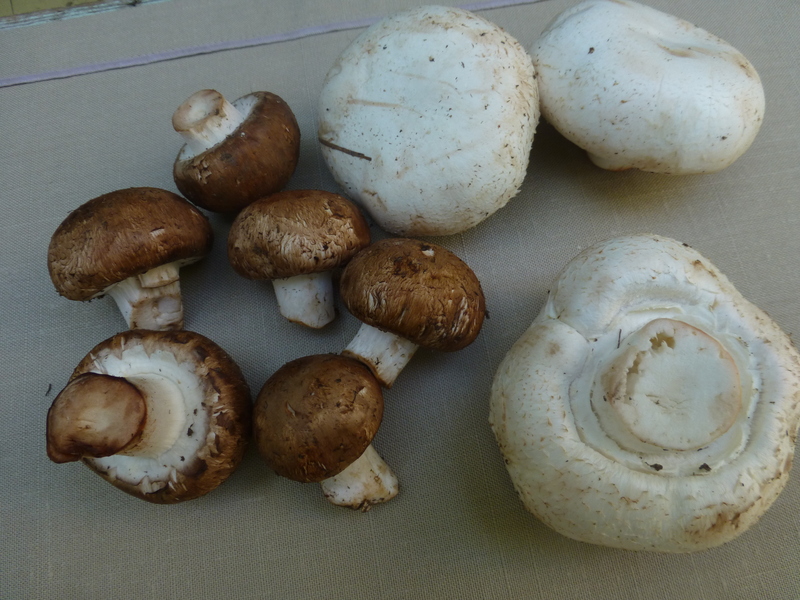 Season to taste with salt and pepper; stir in the fresh cilantro and the lime juice. Remove from the heat, and cool to room temperature. This is a mixture of dried mushrooms, tamarind paste, coconut sugar, dried chili, lemongrass, garlic, shallot, and soy sauce. 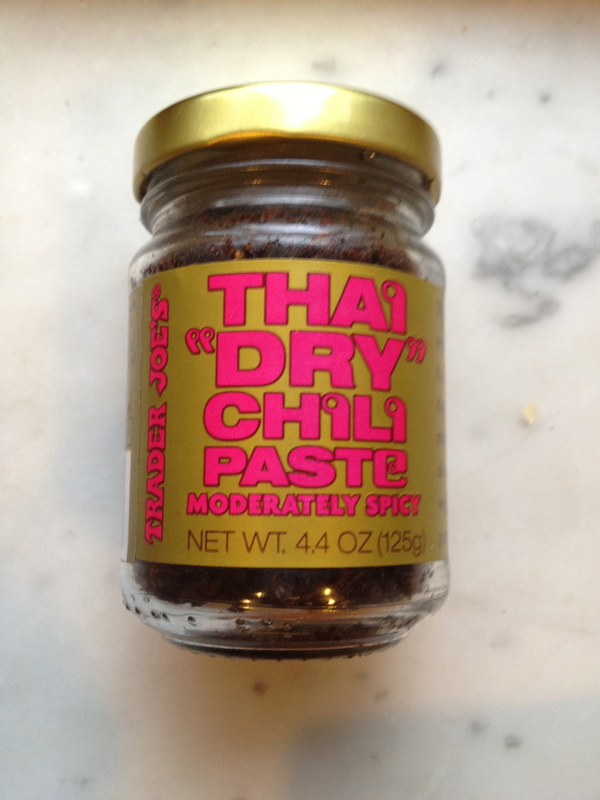 It is a handy condiment to add Asian flavor to your stir-fries and curries. OPTIONAL POTATOES: Place chopped potato in medium saucepan and cover with cold water, add a healthy pinch of salt to the water and bring the potatoes to a boil. Turn heat down and simmer potatoes until soft enough to fall off when pierced by a fork, about 7 minutes. Drain potatoes in a colander and return to the saucepan. Place over low heat and let potatoes dry out their moisture, shaking the pan, 2 minutes. Heat the remaining T. vegetable oil in skillet over medium heat and add 1 tsp. turmeric to the oil, stirring to color the oil, 1 minute. 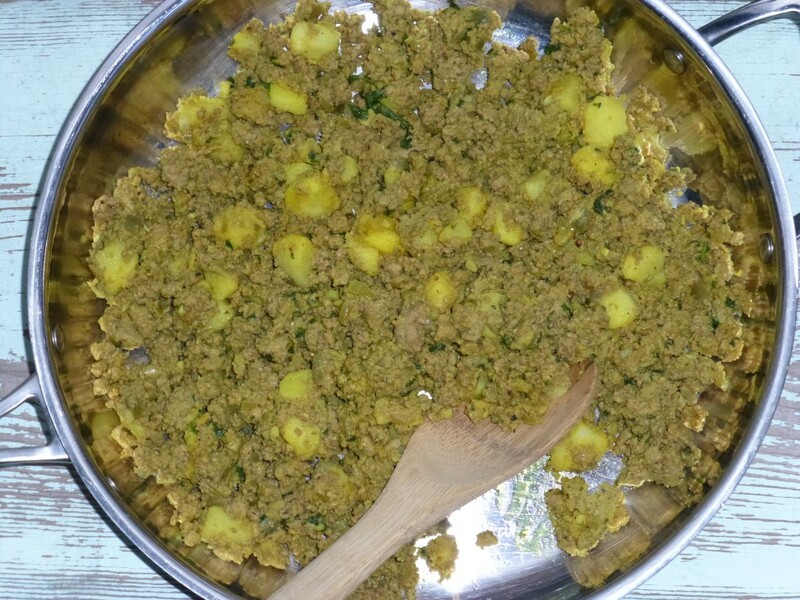 Turn potatoes into skillet and sauté, tossing to coat with turmeric oil, 4 minutes. Season with salt and pepper to taste. Take off heat, and let cool. 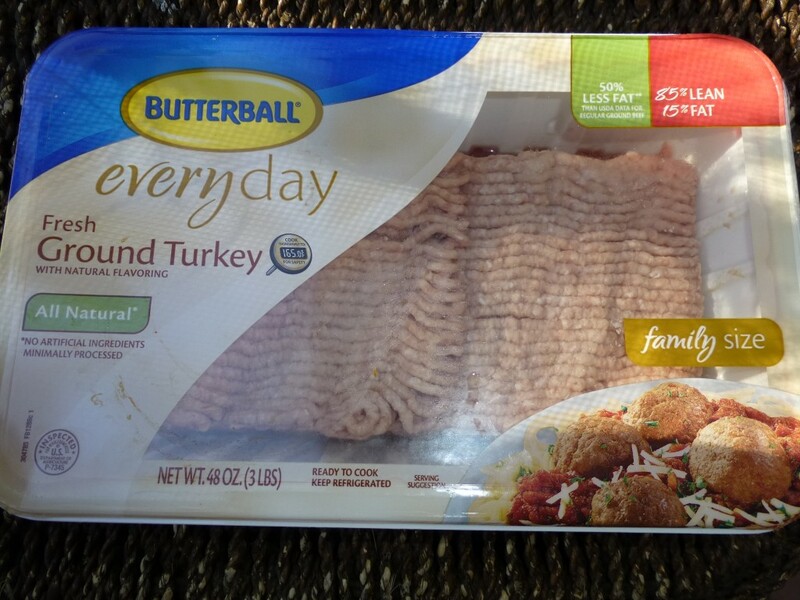 You can add the potato mixture to the turkey mixture and let flavors meld overnight. 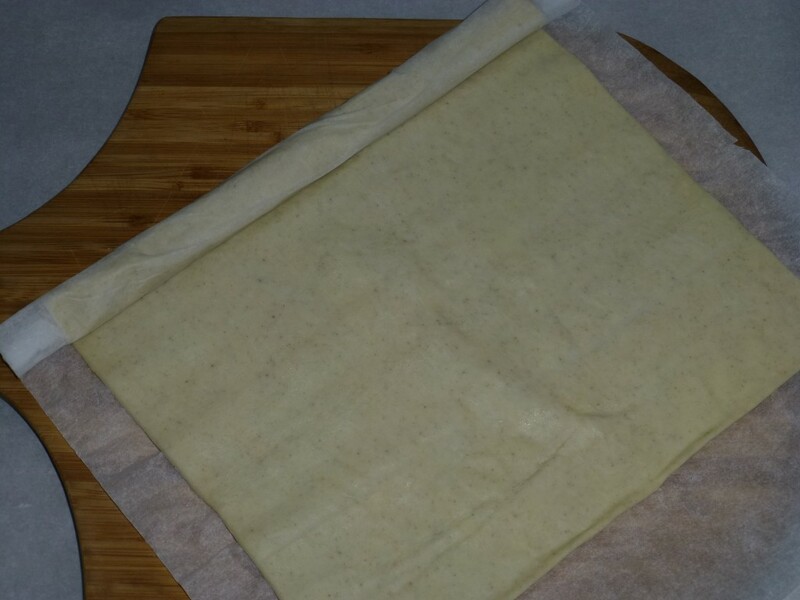 Place a defrosted sheet on your lightly floured board or counter. Cut the sheet into fourths and then cut each square on the diagonal to make a triangle. 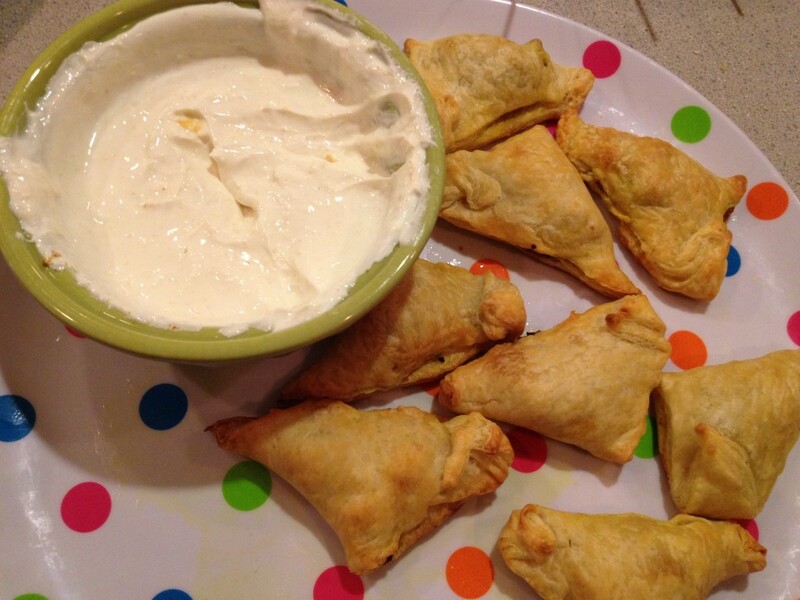 [NOTE: This will give you luncheon-size samosas as in the photo. 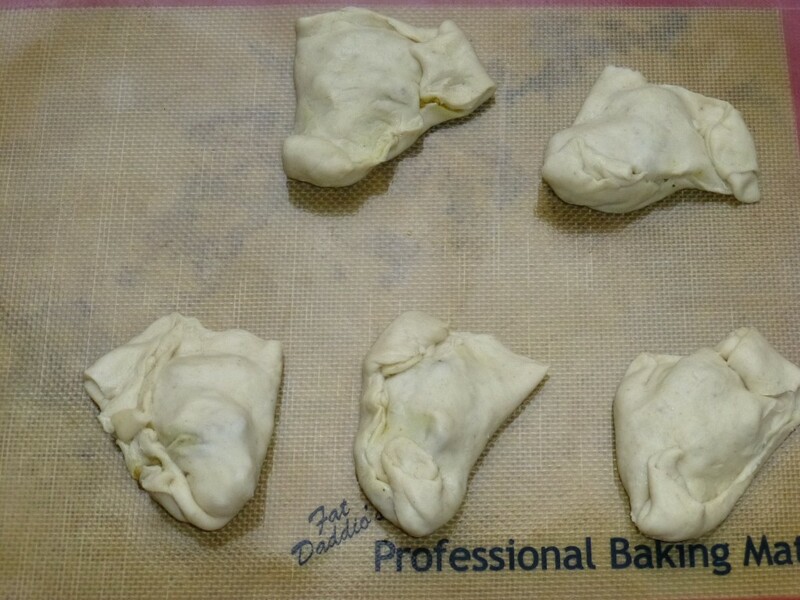 I tested this recipe twice–the first time I made them for lunch; the second I cut the pastry smaller and baked them for the party.) 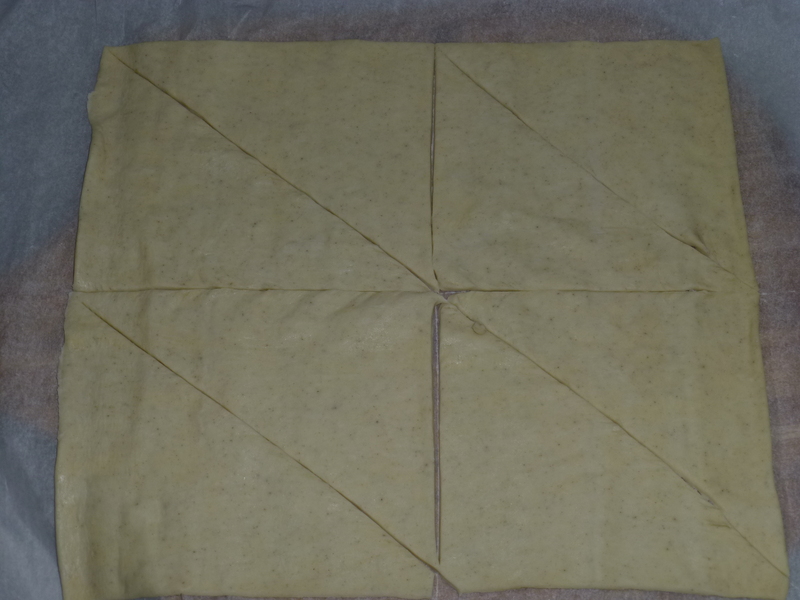 For appetizer-size, cut the triangles on the diagonal to get smaller triangles (about 3 inches). Place a tablespoon of filling in the center of each triangle and fold the point over to reach the other point. Seal the edges by pressing down with your finger. 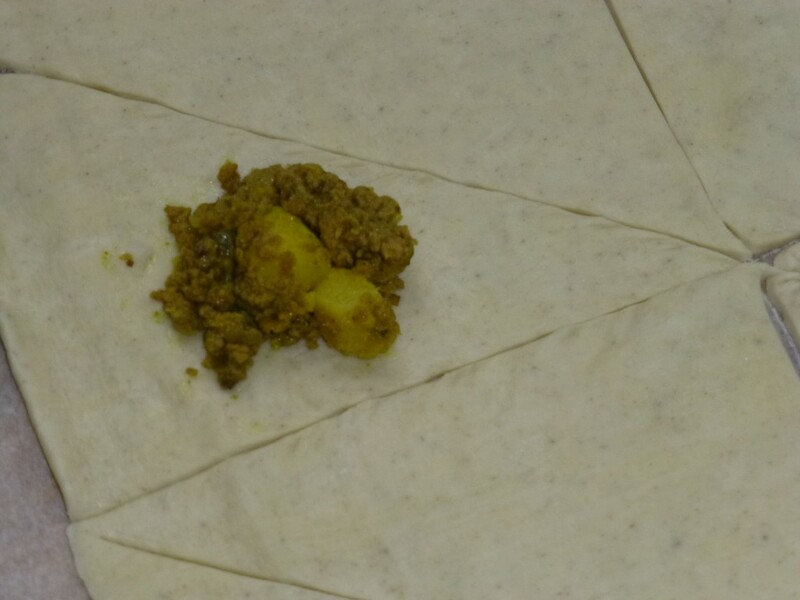 Preheat oven to 400 ° and bake samosas until golden, 18-20 minutes. To make the dip: Put the cilantro leaves in a food processor and process until coarsely chopped. Transfer to a mixing bowl and add the yogurt, lemon juice, and sugar. Stir well, season with salt, pepper. You can also add heat with a chopped jalapeno or with a dash of cayenne. We were serving children at the party so I left the dip mild. 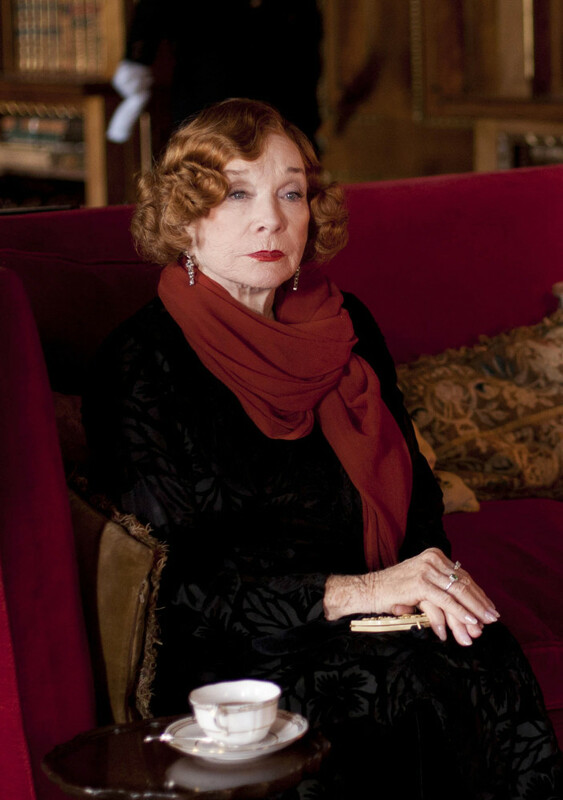 The Dowager Countess always has perfect posture. 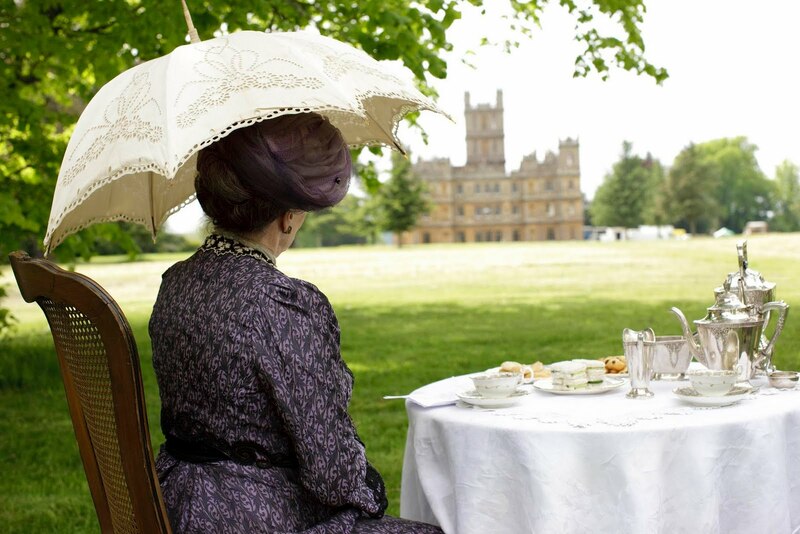 I watched the Downtown Abbey premiere very carefully on Sunday night (Jan. 5) as I was taking notes on all the costumes, interiors, language and social conventions, and looking for all things food, entertaining, traditions, customs and kitchen-related to post about. Zoinks, those Crawleys certainly do drink a lot of tea. Tea in bed in the morning; tea in the breakfast room; tea in the drawing room; they go out for tea; stay in for tea; and indulge in that 1920’s form of entertainment: thé dansant or tea dance. SPOILER: The tea dance was ruined for Lady Rose and Anna as they fled the dance hall to avoid being arrested in the fist fight over Rose. She’s trouble, that one. I don’t know why I find the social norms and conventions of proper entertaining of the past so fascinating, but I do. I love the gorgeous interiors and table settings in Downton Abbey as much as the drama and intrigue. 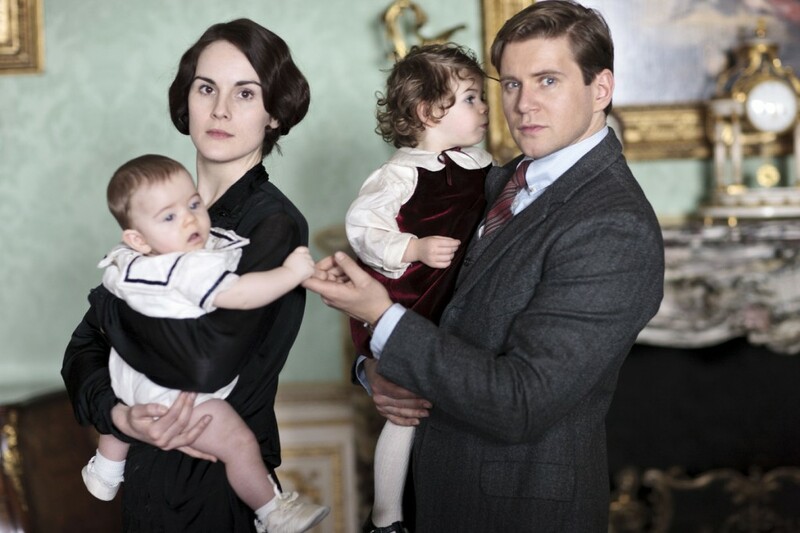 I’m so excited to come up with posts for the 8-week Anglophile-Downton Abbey series on Corks & Cake. 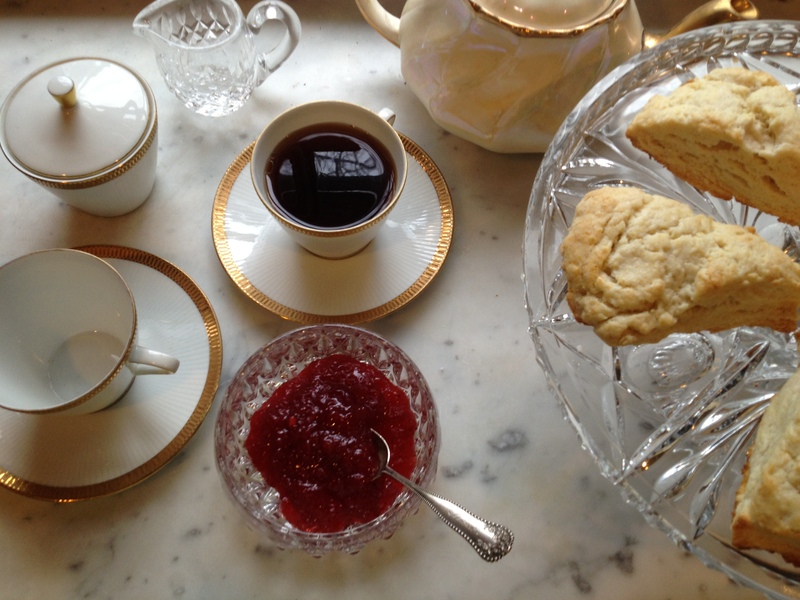 It fits so well with what I’m interested in writing about: celebrations, traditions, all manner of serving food and offering hospitality, showing children how it’s done, and bringing little niceties back to our everyday, even those as simple as finding great pleasure in using a special spoon to stir your tea. So let’s talk tea, shall we? 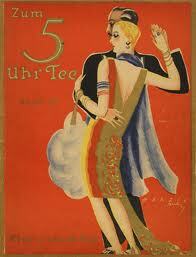 “The afternoon tea with dancing is usually given to “bring out” a daughter, or to present a new daughter-in-law. The hostess receives everyone as at a ball; if she and her daughter are for the moment standing alone, the new arrival stands talking with them until a newer arrival takes his or her place. 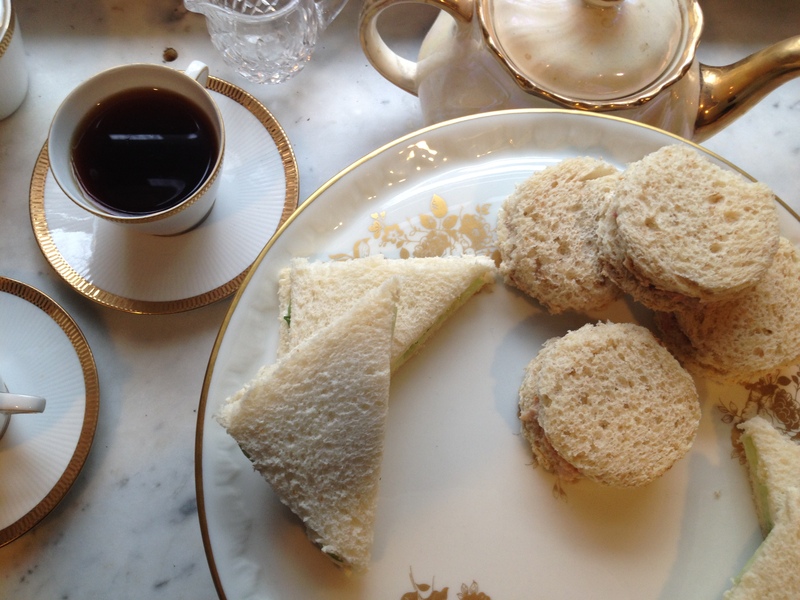 I read the whole chapter of Mrs Emily Post’s book on “Teas and Other Afternoon Parties.” Read it if you are so inclined. Even though Mrs. Post is writing about (and for) an American audience, the upper class in America would look to the British aristocrat for their guideline about how to behave in society. 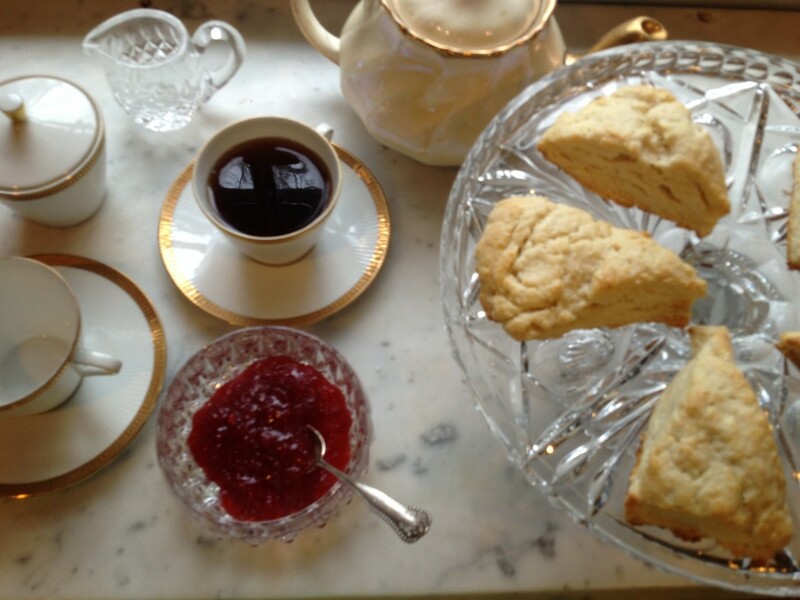 A traditional tea menu for a party would include assorted tea sandwiches, scones, and a rich tart or cake of some kind. Tea sandwiches could include cucumber, sliced radish, cream cheese, spreads of ground meat and cheese, herbed butter and the like. 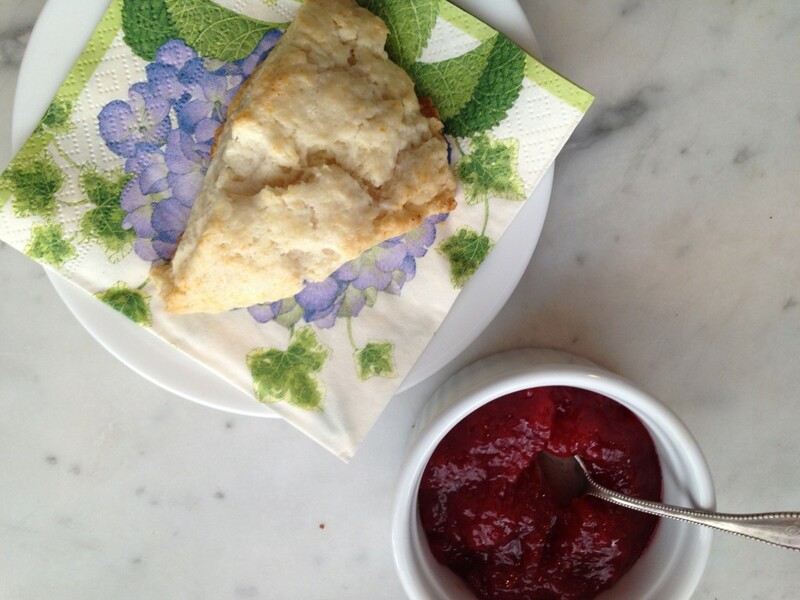 Scones could be plain or include raisins or fruit and would be served with soft butter, jam, and clotted cream. The cakes and tarts would most likely be lemon, vanilla sponge, almond or jam-filled. 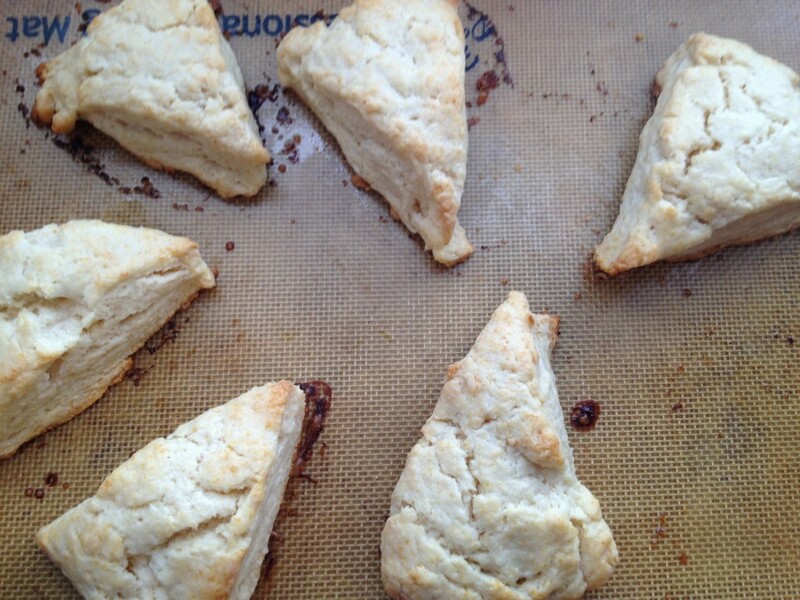 Inspired, I tested this recipe for Dreamy Cream Scones from Smitten Kitchen for our weekend morning breakfast. 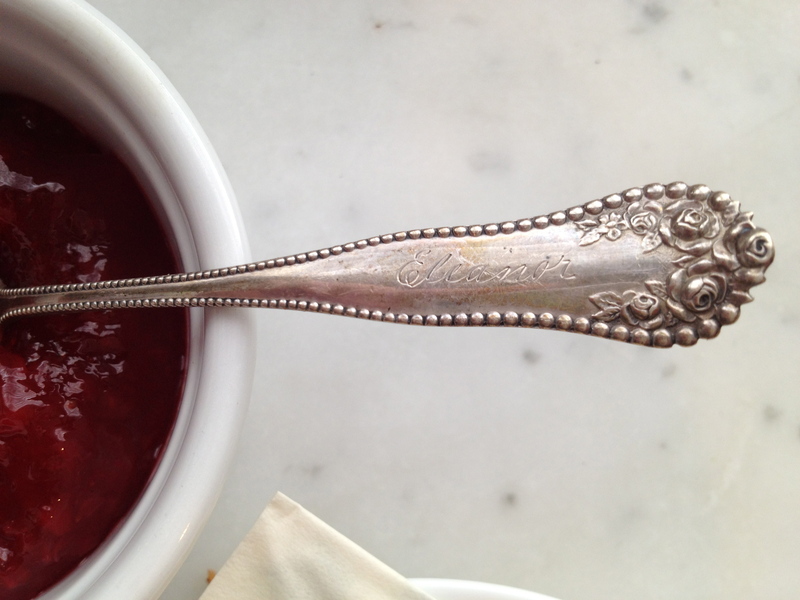 When I was styling the photo and looking for just the right spoon to serve our jam, I found this sweet one from John’s mother, engraved with her first name. Lovely engraved silver jam spoon. I can see from its extreme close-up it needs a bit of a polish! The definition of ‘forever:’ 2 people and a ham. Chop the ham in the food processor, until it is a roughly smooth texture. 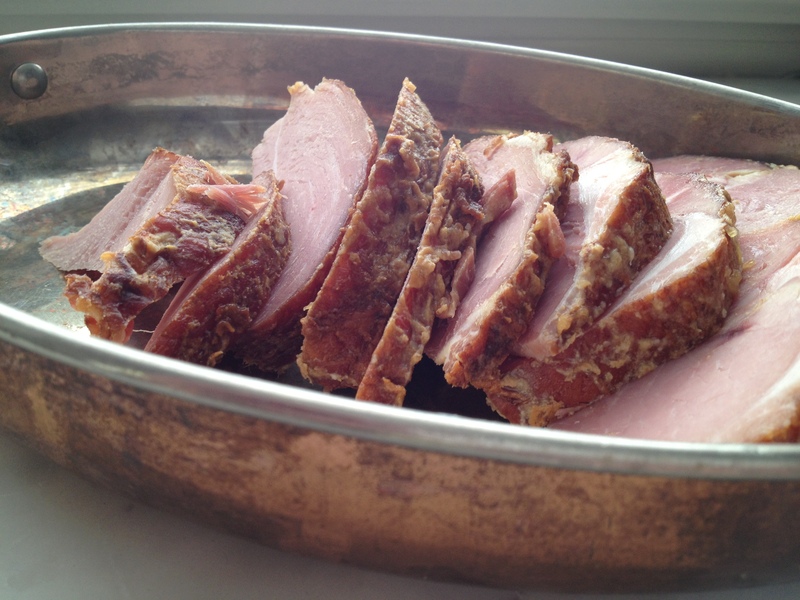 Turn the ham into a bowl and add the other ingredients, folding them in with a spatula. 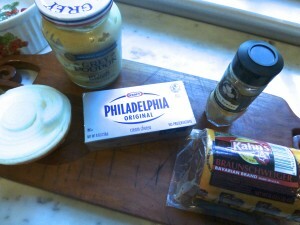 Taste and adjust any seasoning or add more mayonnaise and mustard if you’d like a wetter mixture. 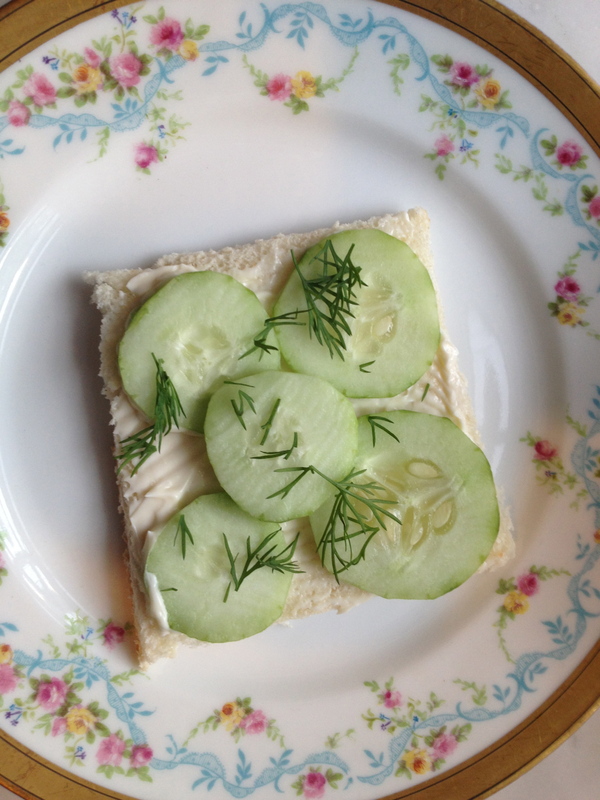 Cut thin white or wheat bread into circles with a biscuit cutter (or cut them into triangles or fingers.) Do not forget to cut the crusts off, as Mrs. Post directs! Spread ham on one side of bread and place another bread round on top. Serve on your prettiest plate or cake stand. Cheers all, and tune in next week for my interpretation of what Mrs. Patmore would do with that leftover ham bone. 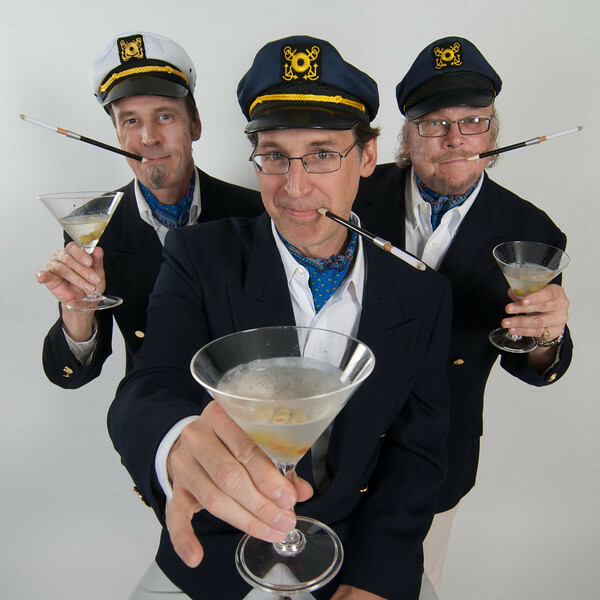 Pantomime is an eccentric British theater institution. Usually performed at Christmastime, pantomine (slang, panto) emerged during the Restoration with roots in the commedia dell’arte of Italy. By the beginning of the 19th century, this wonderfully strange, campy, corny, quirky mix of musical comedy and fairy tale had become a tradition. Young Queen Elizabeth and her sister Princess Margaret performed in these musical comedy stage productions around Christmas and New Year’s, as pantos were a big part of their holiday celebrations at Windsor Castle, where they lived after evacuating from Buckingham Palace during wartime. 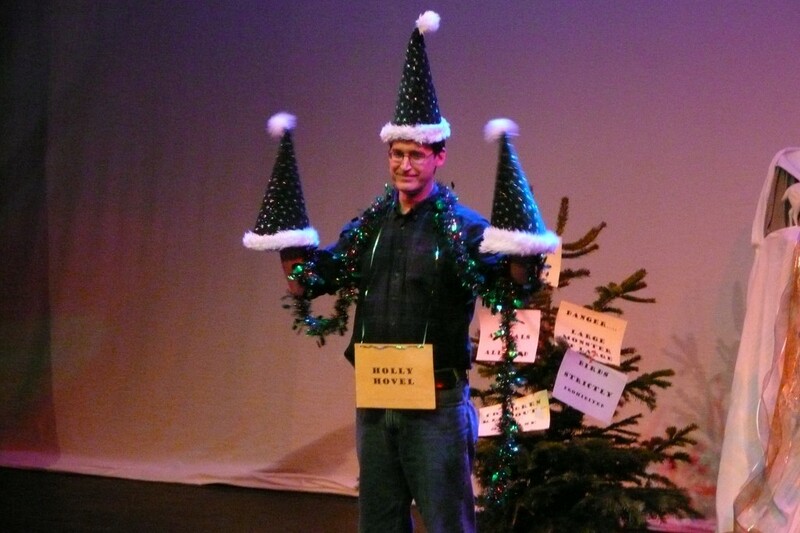 JP endures the indignity of being a prop in the 2008 panto in England. 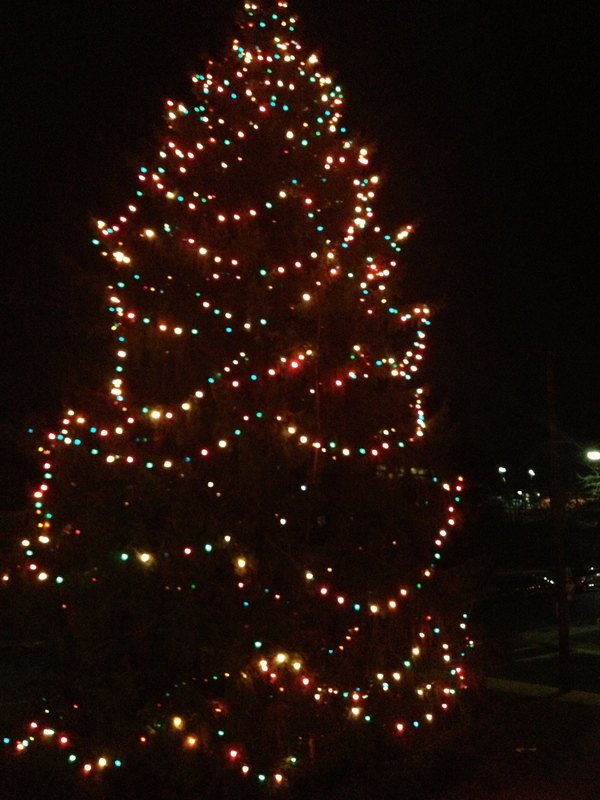 Back at home in Maryland, we have the beginnings of a new Christmas tradition with our friends, Chris and Adrienne Harrington. The British Players (formerly The British Embassy Players) mount a Christmas pantomime production at the Kensington Town Hall each year. 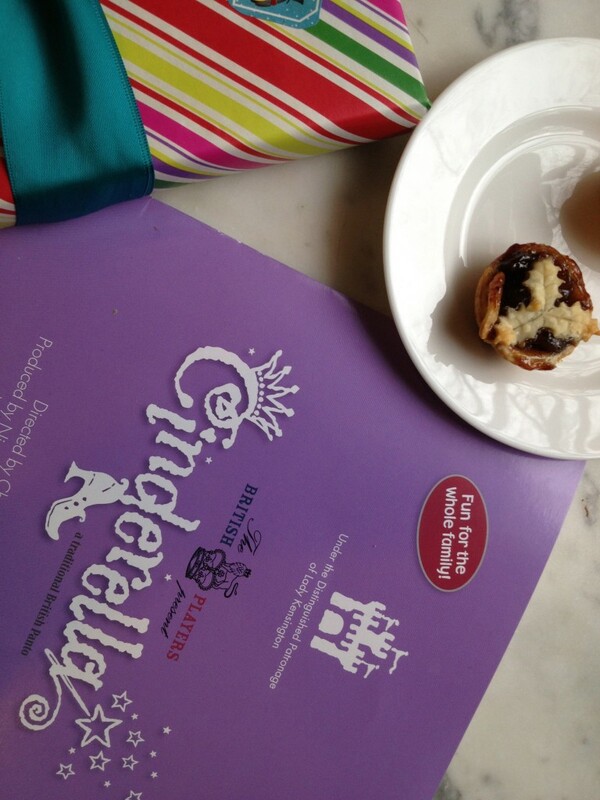 This year was Cinderella, a traditional British panto directed by Charles Hoag. 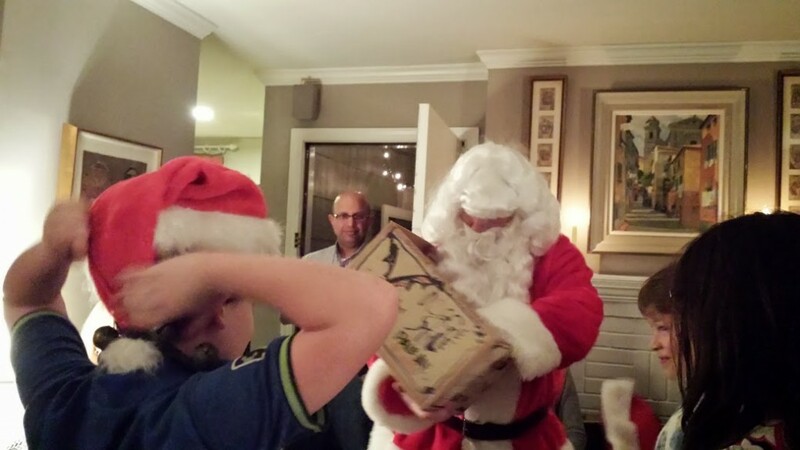 Chris purchased a passel of tickets for several friends and their children and away we went. After the play we adjourned back to our house for dessert and hot chocolate. 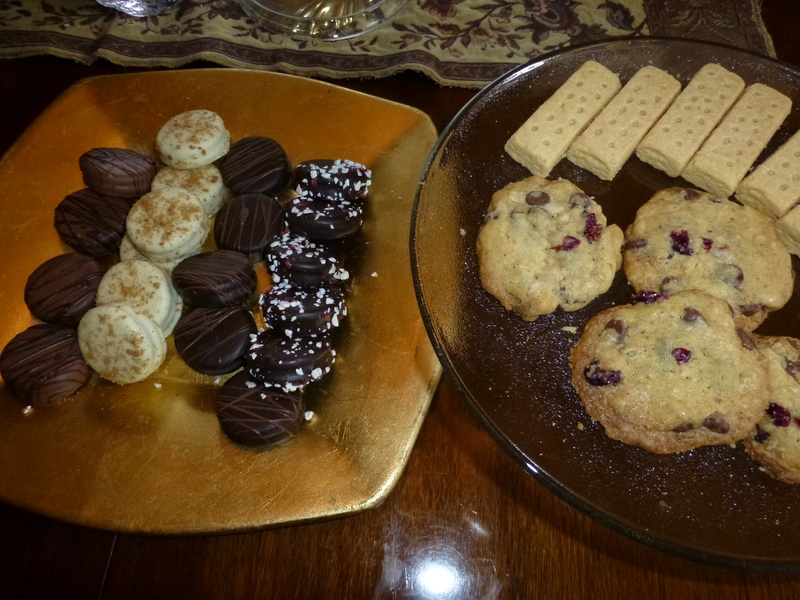 I set up an assortment of cookies and treats in various shapes, sizes, flavors beforehand on the buffet. 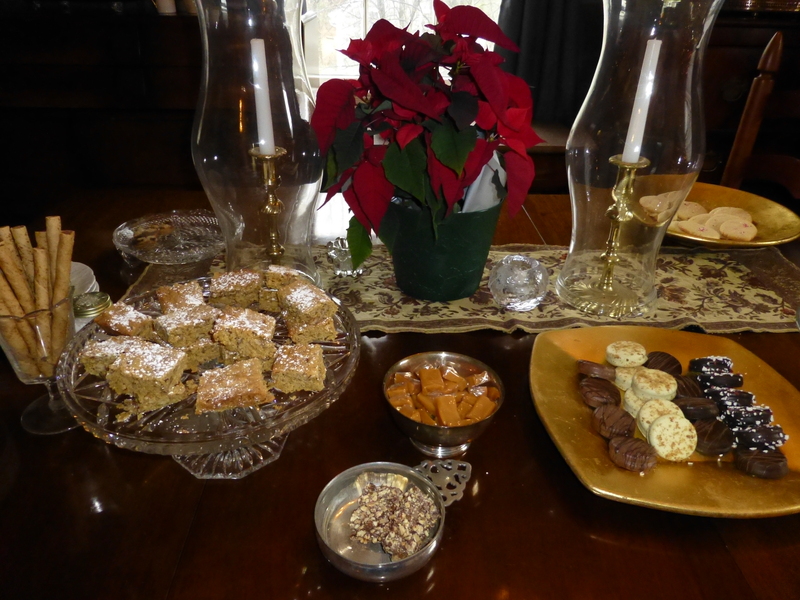 I knew I wanted an abundance of offerings but couldn’t make it all, of course, so I baked some homemade cookies and bars and rounded it out with my favorite seasonal treats from Trader’s Joe’s. These are everyone’s absolute favorite cookie. I think I made at least 9 dozen throughout the Christmas holiday to eat and give as gifts. 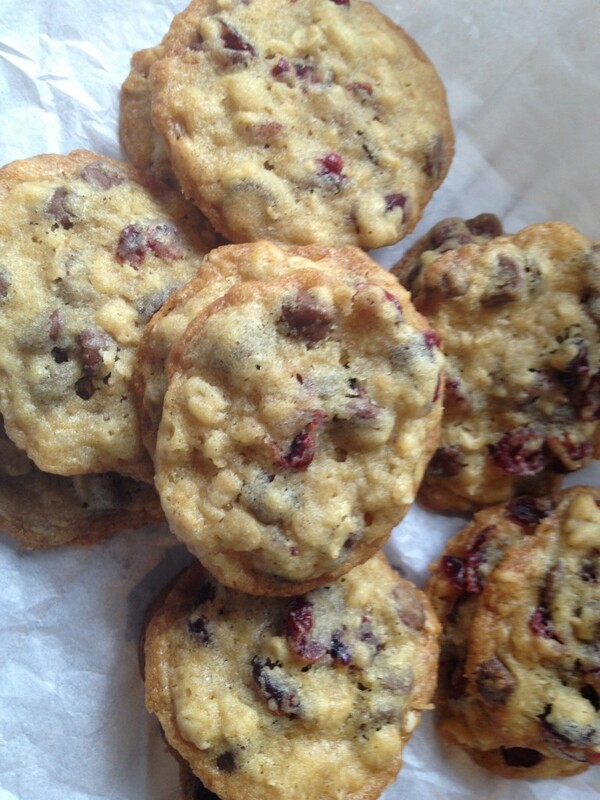 I found the recipe at one of my new favorite blogs, She Wears Many Hats. 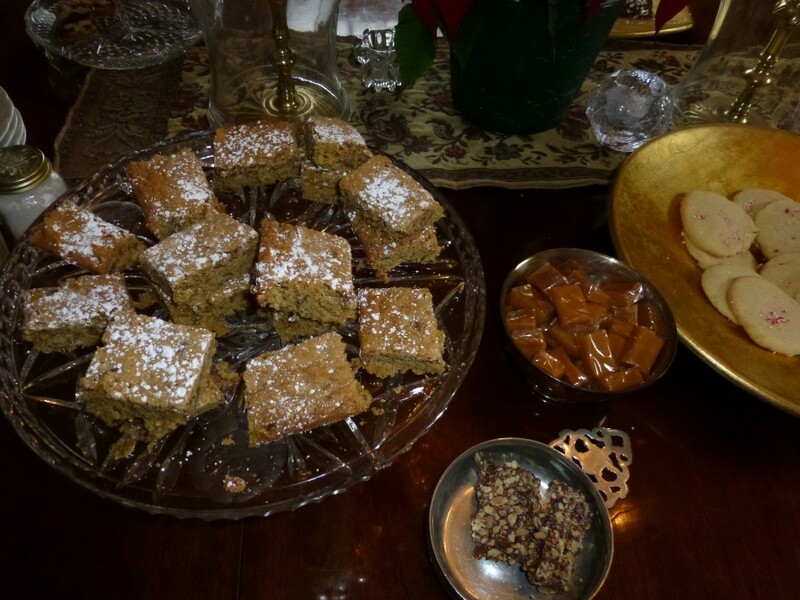 This is a vintage recipe, dating back to the 1900s, but no one seems to know why they are titled ‘Chinese.’ Some recipes call for dates and walnuts, but I followed She Wears Many Hats and made these with just pecans. They were like a blondie without chocolate. Chewy in a good way with lots and lots of brown sugar. I made a batch of Sugar Cookies with Sprinkles for those who don’t like chocolate or nuts. I can’t say I was blown away with them (why are sugar cookies so hard to get right?) so no recipe to recommend. (Left: Pepperidge Farm Pirouettes with Chocolate and Hazelnut. 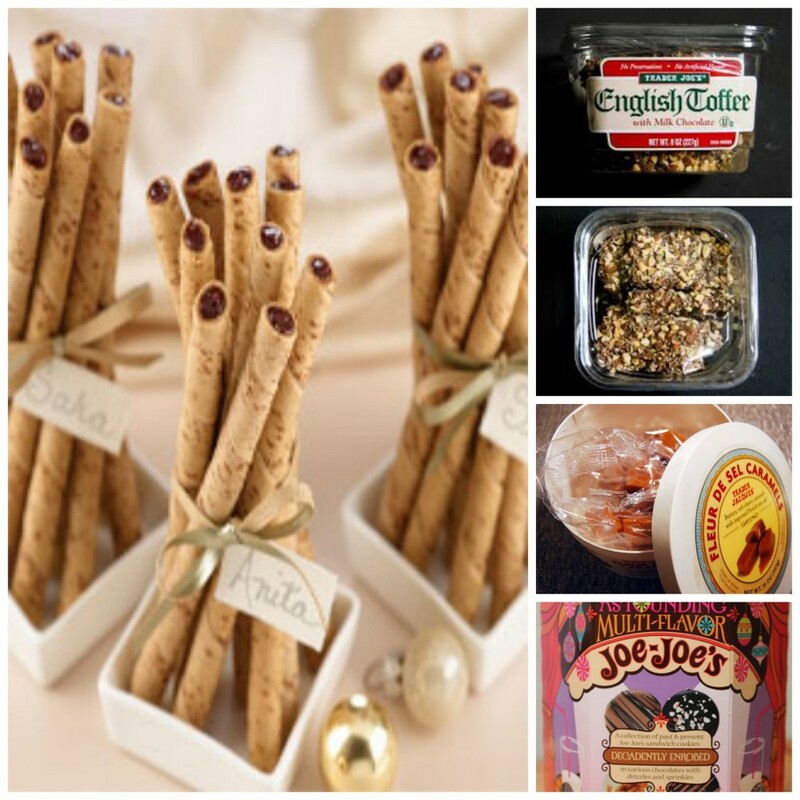 (Top to bottom: Trader’s Joe’s English Toffee, Trader Joe’s Caramels with Fleur du Sel, Trader Joe’s Jo Jo Cookie Assortment (like chocolate-covered Oreos). Everyone at our house gets shortbread in their Christmas stocking. 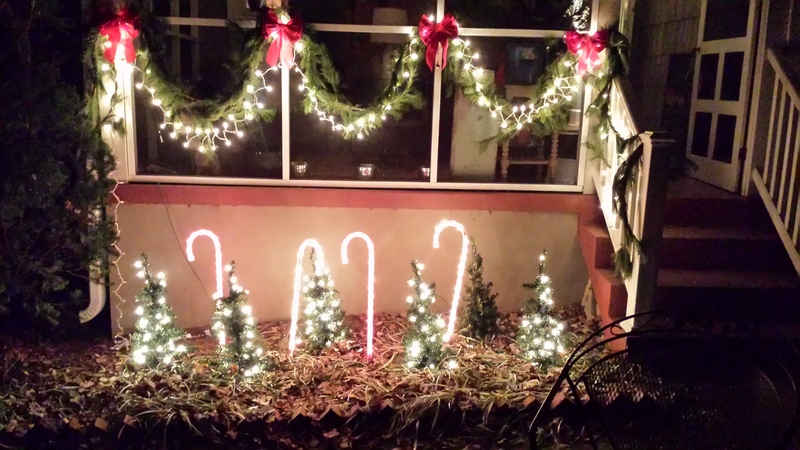 We decorated the front porch with candy canes, garland and mini trees. 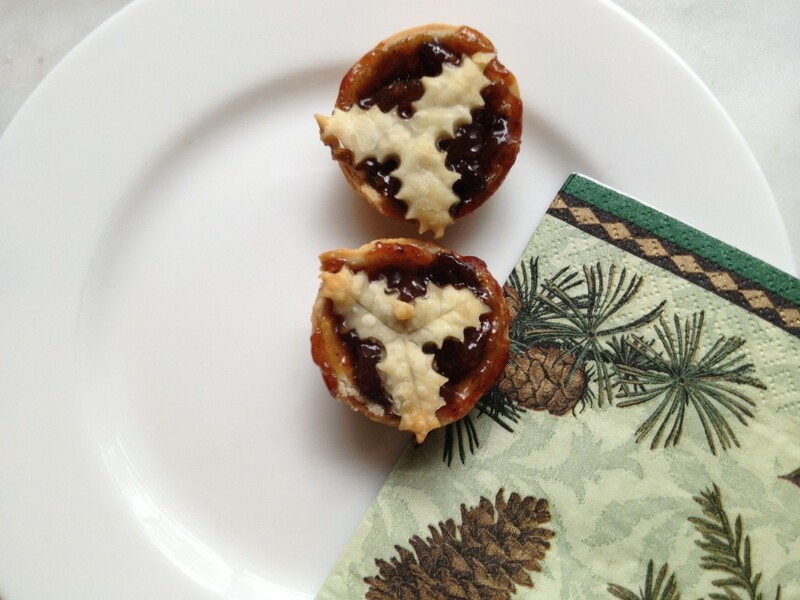 And a lovely guest brought the cutest miniature mince pies–an English tradition! 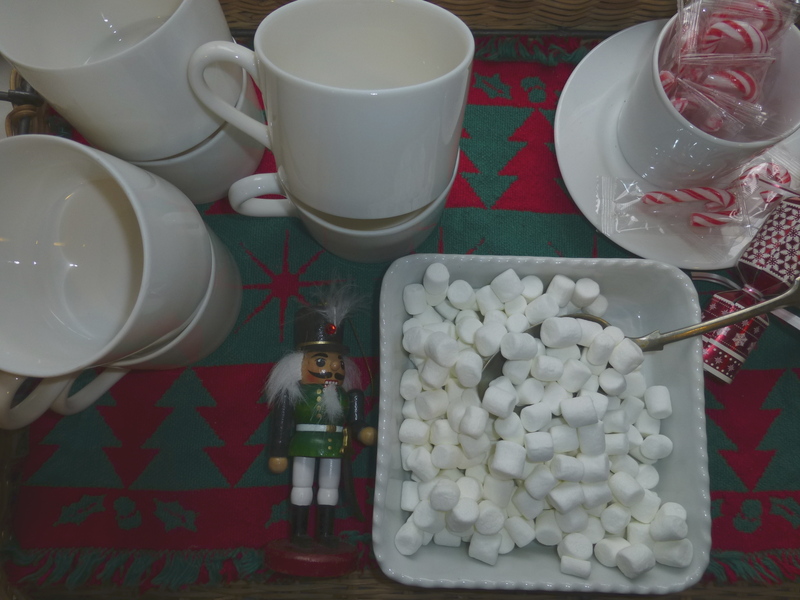 Another lovely friend brought a big bowl of Chocolate Mousse and the children had hot cocoa with mini marshmallows and candy canes. We passed around a bowl of Spiced Pecans and a bowl of smoked almonds, both excellent with the various sparkling wines we served. 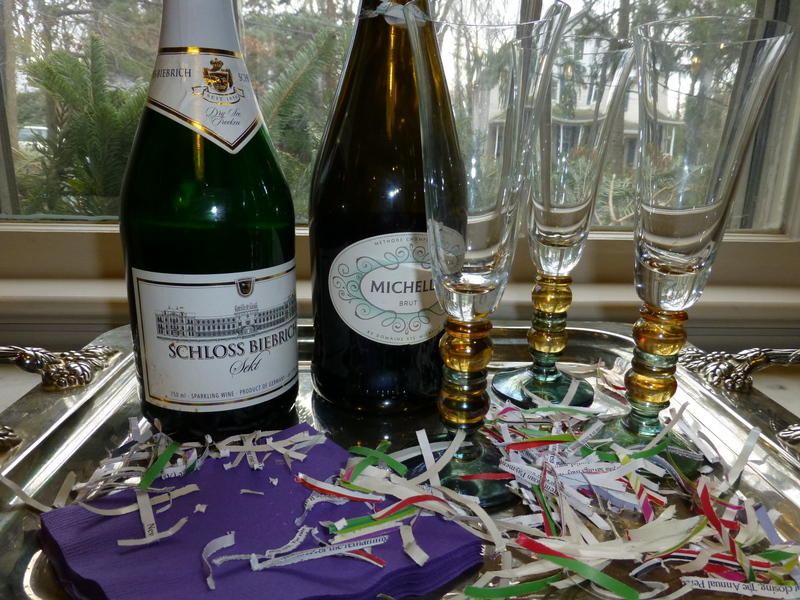 Schloss Beibrich Sekt is a wonderful sparkling wine from Germany. A great buy. Michelle Brut from Columbia Valley in Washington State another lovely find! And let’s not forget my favorite potato chip: Kettle Brand Salt and Pepper Chips. Because it’s not a party without a potato chip, in my opinion. We served an assortment of beverages, including lemonade, Pellegrino, Coke and Diet Coke, Capri Suns for the kids, white and red wines and IPAs for the adults. I had planned to offer coffee and put out the china cups and saucers beforehand, but we totally forgot to brew it or offer it. Since the play didn’t wrap up until 9:30 pm, this was a late party and no one asked for coffee as I’m sure they wanted to go to sleep at midnight with visions of sugar plums in their heads. The marvelous tree at Kensington Town Hall, large and festive. Hope everyone had a happy Christmas! Thank you, Chris and Adrienne for the panto tickets and the lovely new Christmas tradition. Lovely cookies on my favorite Herend platter. Fancy! 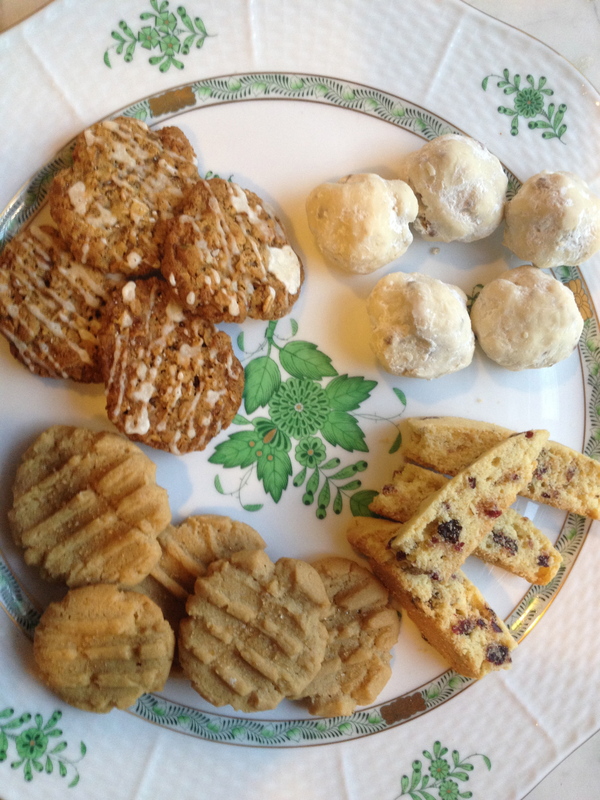 I was pleased to take part in the 3rd Annual Great Food Blogger Cookie Swap this year. 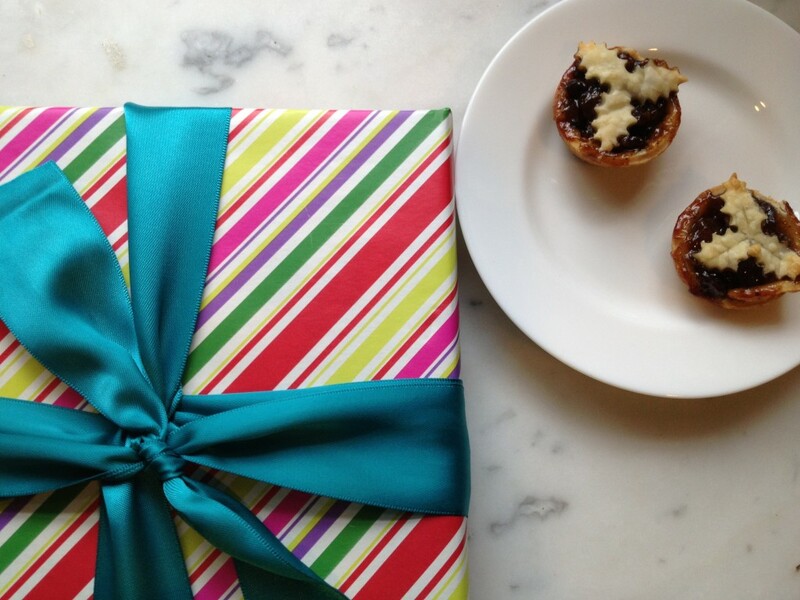 This is like the old-fashioned cookie exchanges, except it’s all organized online (thank you Lindsay and Taylor of Love & Olive Oil and Julie from The Little Kitchen) and you are matched with bakers from all over the country who send you presents! What could be more wonderful than that! More wonderful than that is that the Cookie Swap is also a fundraiser for Cookies for Kids’ Cancer and this year bloggers raised close to $15,000 just by baking and sharing cookies! Donna Elick from The Slow Roasted Italian, hailing from Arizona. 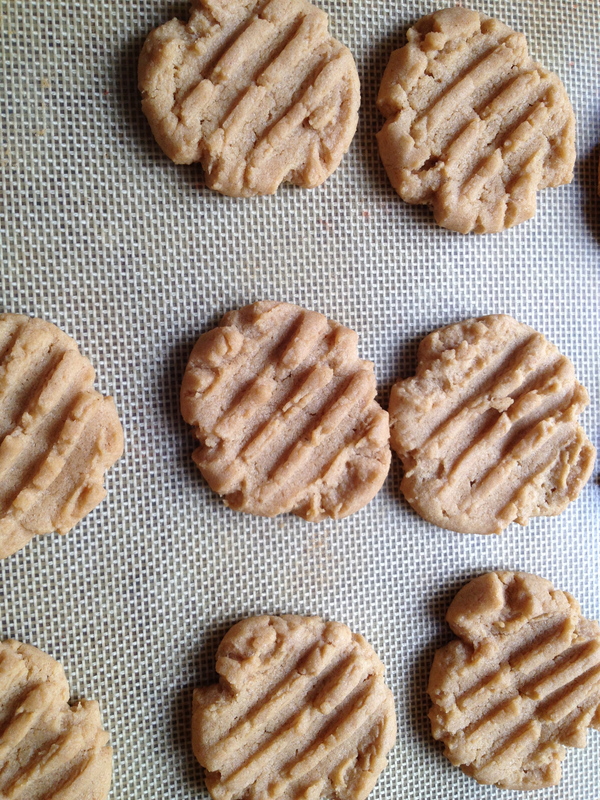 I love this cookie for its full-on, authentic peanut butter taste and the fact that it only uses 4 ingredients (!) and no flour. If you’ve got peanut butter, sugar, an egg, and some baking soda, you can make this cookie, even during one of the busiest holiday times of the year. This cookie recipe is so simple, you only need 4 ingredients. 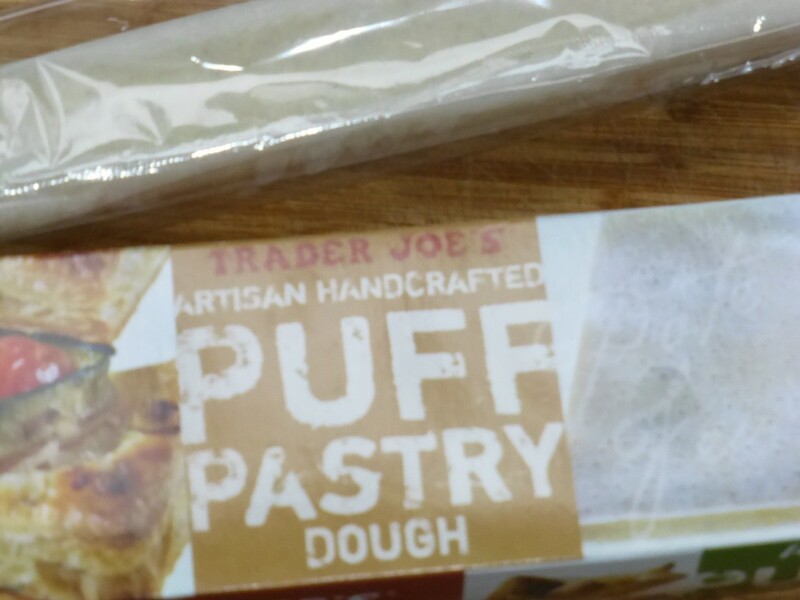 It’s a go-to in our house, especially during the holidays when I am crazy busy, want to bake for the kids, but don’t want to think too hard about it! Rolling the cookies into balls before your smash them with the tines of a fork is a perfect task for little hands who want to help. From The 150 Best American Recipes, Indispensable Dishes from Legendary Chefs and Undiscovered Cooks, Fran McCollough & Molly Stevens, Houghton Mifflin, New York, 2006. In a large bowl, with an electric mixer, beat the peanut butter and sugar until well combined. 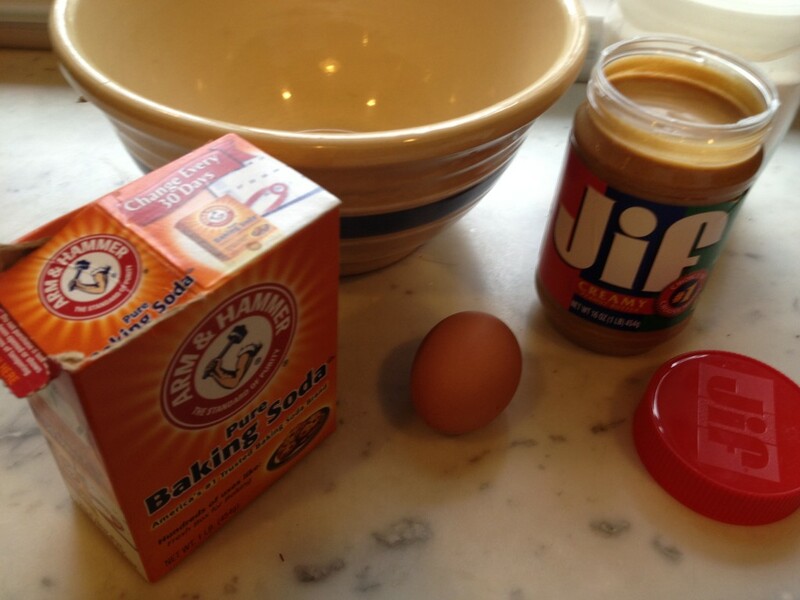 In a small bowl, lightly beat the egg, then beat it into the peanut butter mixture along with the baking soda until well combined. Let cool on the baking sheets for 2 minutes, then transfer with a metal spatula to wire racks to cool completely. Store in an airtight container for up to 5 days. 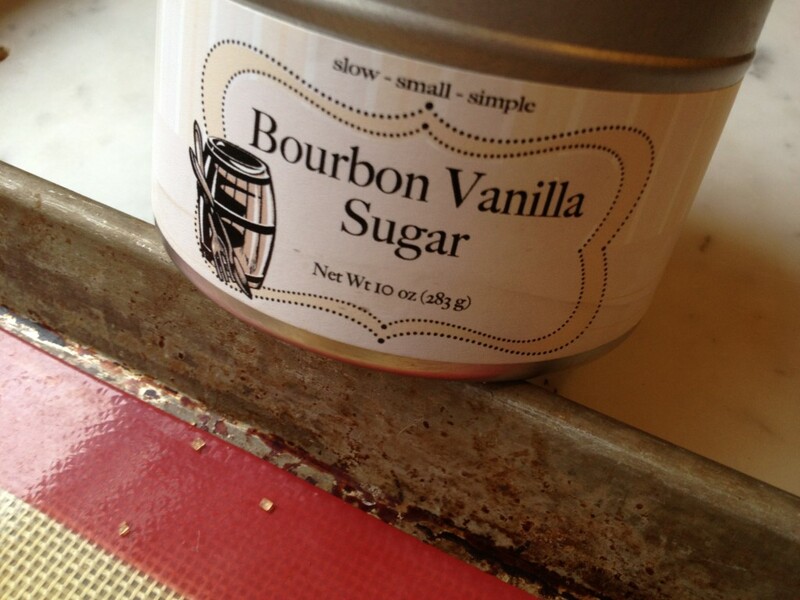 I sprinkle mine with a little turbinado sugar or bourbon vanilla sugar when they are warm. I packaged those babies up and mailed them off. Here’s my favorite trick for packing material. 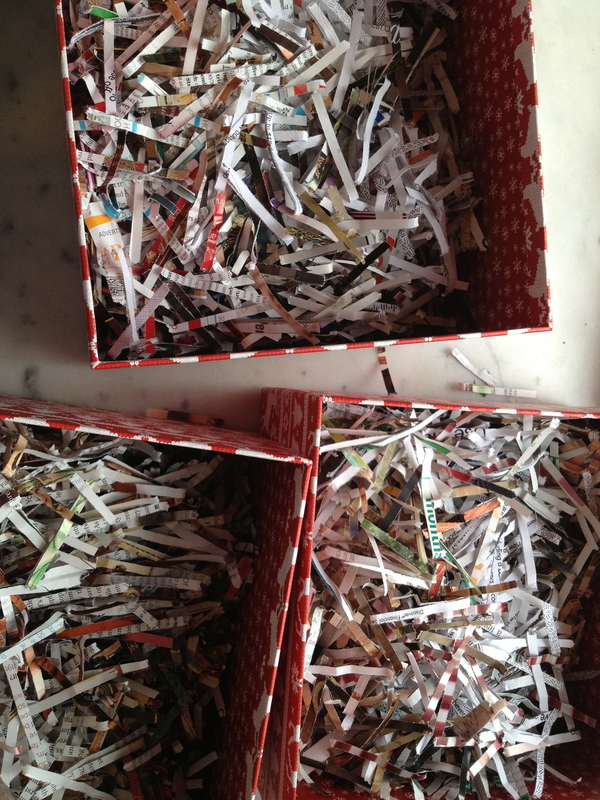 Shred those interior design magazines (the colorful pages) you were going to recycle. Be sure not to use your husband’s shredded credit card offers or he will have a fit. Ha. This project was great fun and reminded me almost daily of my dearly departed Mom, who used to bake prodigiously at Christmas and always had a plate or tin of homemade delicious cookies at the ready for guests, friends, visitors, children, and really anyone who gave her a hand and who she thought deserved a cookie. 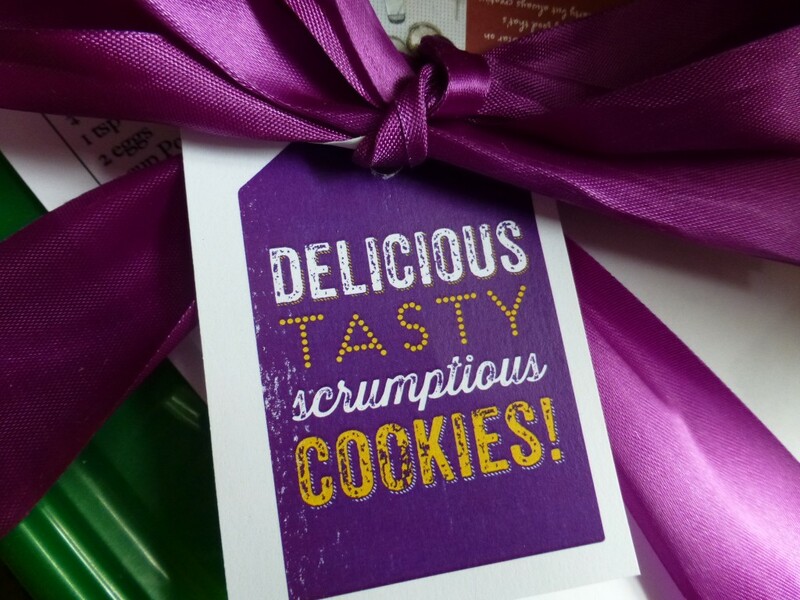 Thank you the organizers and brand partners of the Great Food Blogger Cookie Swap 2013 for such a wonderful experience and opportunity. 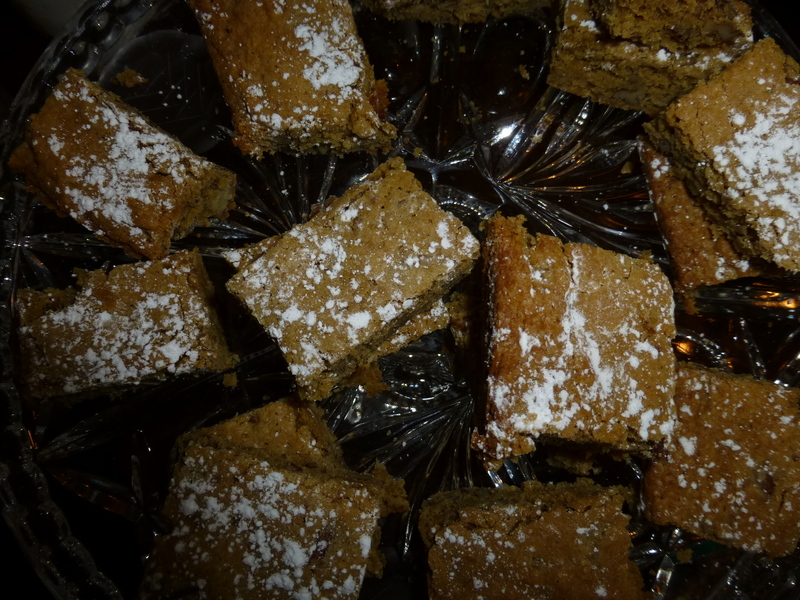 Shout outs to: OXO, Dixie Crystals Sugar, Gold Medal Flour, and Grandma’s Molasses. 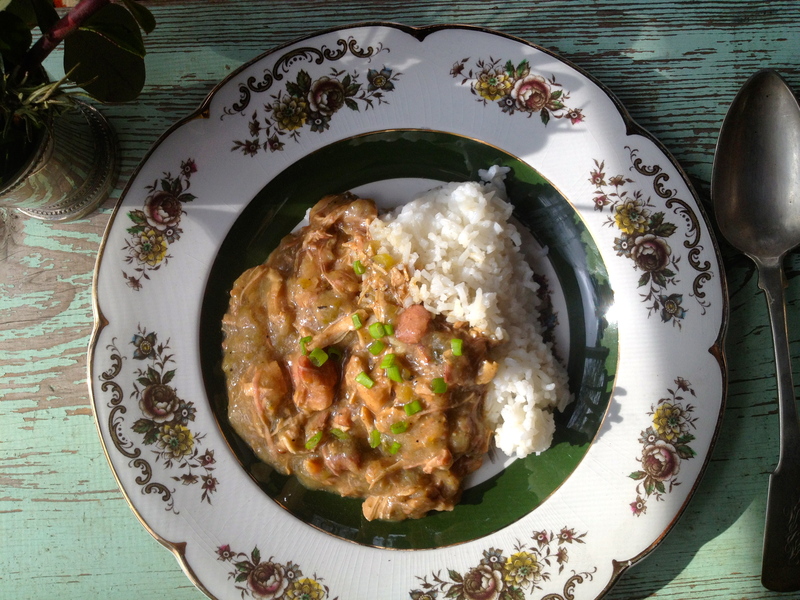 Don’t throw out that turkey carcass–make gumbo! Heat the bacon fat til hot but not smoking in a large heavy-bottomed stock pot and add the flour, whisking constantly. Cook the roux at medium-high heat for 10 minutes, whisking constantly so it doesn’t burn. Roux should be a caramel color. Add the chopped onions and sauté until softened. Add celery and green pepper and sauté until softened. Add the chopped garlic and sauté (do not let garlic scorch.) Add the rounds of sausage and sauté til browned. Add the leftover turkey meat. Add the bay leaves, thyme, salt and pepper. Simmer over low heat for at least 2 hours. Remove the carcass. Taste and adjust the seasonings (add more salt, pepper, thyme). Add the chopped parsley. Add 3 tablespoons of filé powder and simmer slowly, stirring until slightly thickened. Serve over white rice, with your family’s favorite hot sauce on the side. 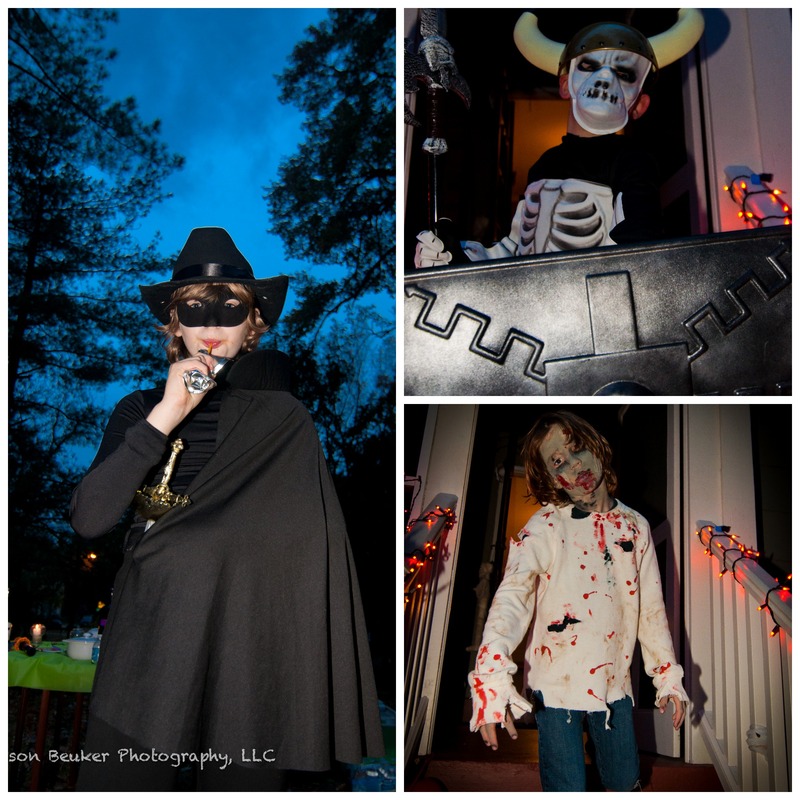 Ghouls and Goblins: Halloween Party! Back when I was single, I have to admit I thought Halloween was annoying. You have to go buy candy that you don’t want. You have to answer the doorbell that is interrupting your evening. You would rather turn off the lights or go out. Now that I’m a parent Halloween is unavoidable. And I have to admit, I love the creative aspect of it. I find myself completely immersed in pinning Halloween craft projects on Pinterest. I can’t help but buy more Halloween decor every year at thrift shops. We spend weeks talking about Joe’s costume ideas, and then days shopping for said costume and props. 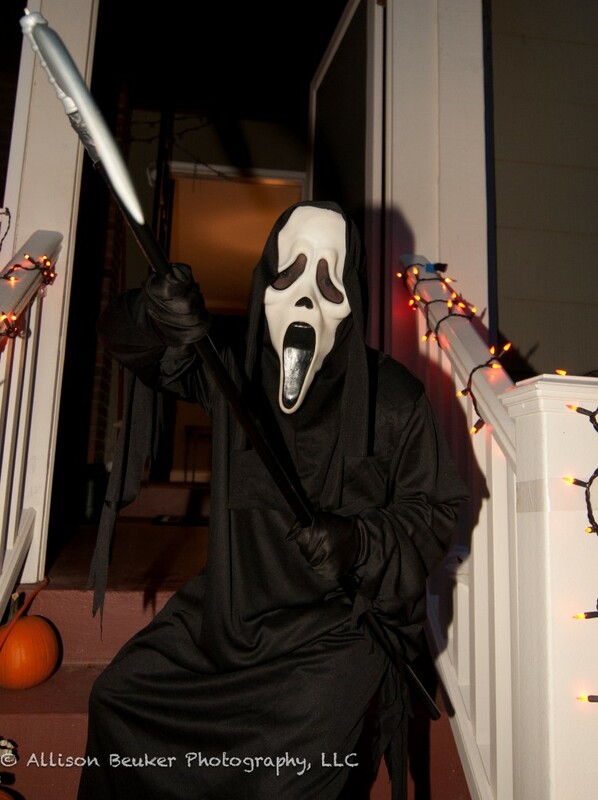 I invite Joe’s friends to come over and do the outdoor decorating and we transform the front yard with spiderwebs, gravestones, dorky signage, a strobe light on the porch, a mechanical ghoul on a motion sensor, streamers, and lights. Go away! Halloween is not fun. Wait, yes it is! 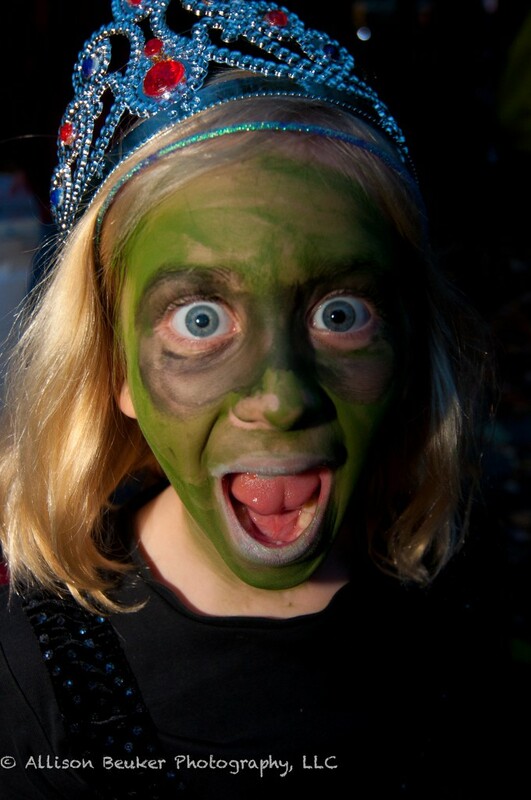 It is a great opportunity to see all the kids in their costumes and have some spooky fun. Prepare your guest list. We like to be inclusive so all trick-or-treating age kids and babies on the 3 streets that comprise our neighborhood are invited. Send out an invitation. 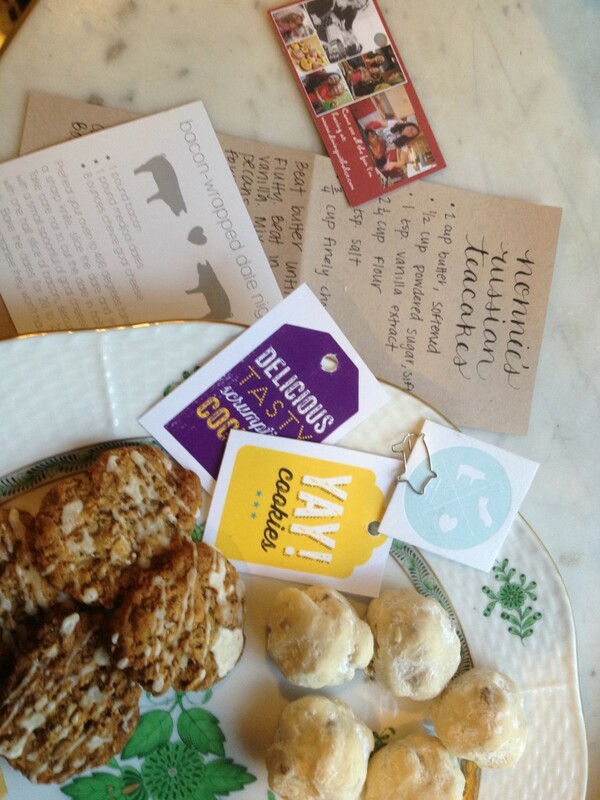 We like Evite and Paperless Post for their cute invitations and easy way to track RSVPs. Some families have filters that block those emails and some families I don’t have email addresses for so we also do a paper flyer that a helpful mom puts in the appropriate mailboxes. Lay in your supplies and groceries. We have pizza delivered so there’s no cooking. 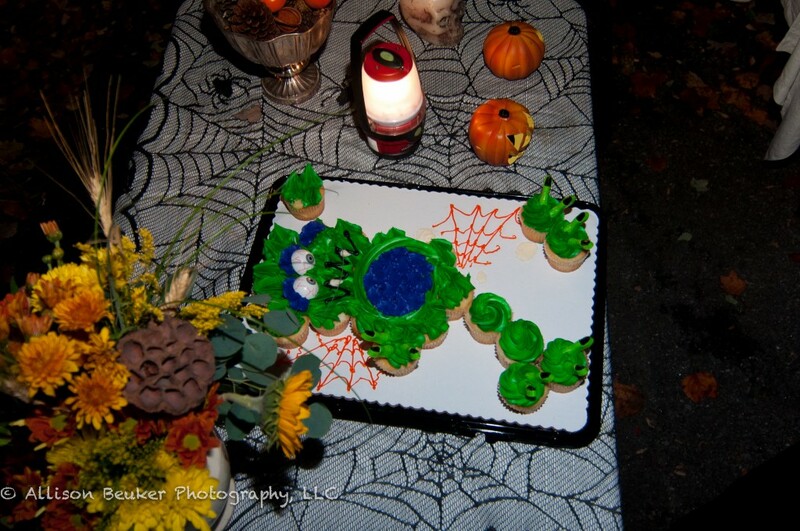 Make sure you have enough Halloween-y paper plates and napkins. We also buy bottled water, sodas and ice. And candy. Don’t forget the candy. 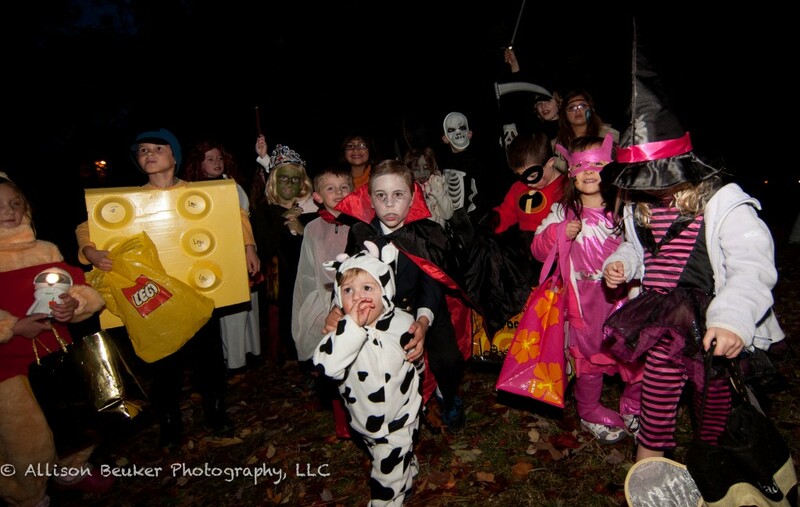 Start the party before sundown so the little ones can get an early start on trick-or-treating and you get to see everyone’s costume before dark. Guests often want to know what they can bring so delegate dessert and appetizers. It is BYOB for adults but do have a cooler filled with clean ice, a full ice bucket with tongs, bottle and wine openers, and cups for those adult beverages. Make your Halloween playlist or set your ipod to Pandora’s Halloween Party Radio station. Michael Jackson is a must. Loud speakers are a must. Blast it! Time to trick or treat! Give us some candy or we will egg your house. Many, many thanks to Allison Beuker of Allison Beuker Photography for the outstanding pictures that captured the children’s infectious Halloween excitement and creativity. Perfection. 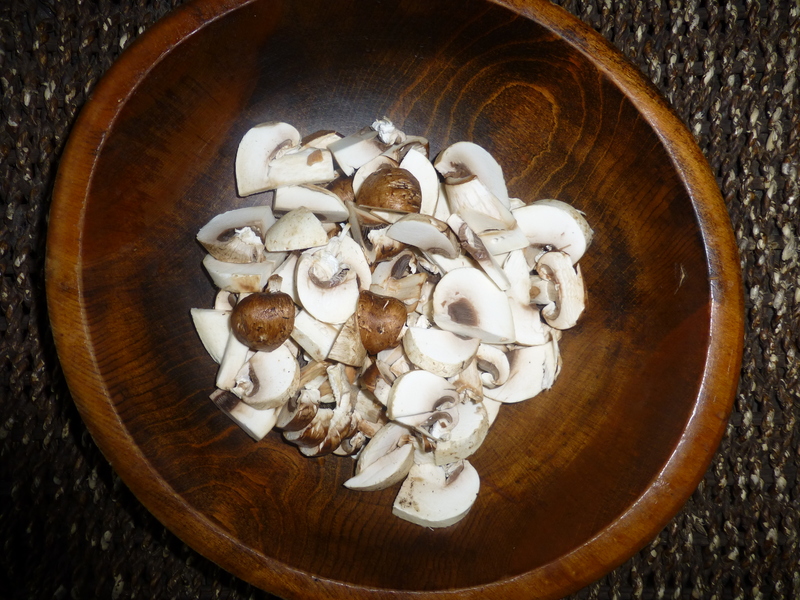 Mushrooms and wild rice were a centerpiece of my Minnesota childhood holiday meals. Both ingredients were considered “spendy” (Minnesota slang for expensive), and thus we didn’t have them everyday. On Thanksgiving, Christmas, and Easter my mom would break away from the budget and our guests would be treated to luxurious dishes that made these holidays special, such as Minnesota Wild Rice Casserole which combined sautéed onions, green pepper, celery, button mushrooms, chopped pimento and lots and lots of butter. 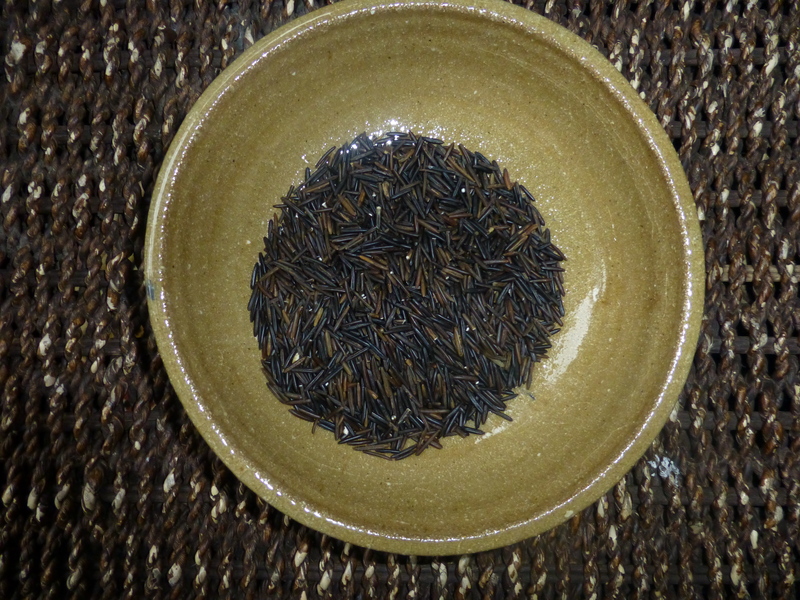 Wild rice is actually a grass, sustainably harvested by hand by the Ojibwe Nation in northern Minnesota. Mushroom and wild rice soup was a budget-friendly alternative. You could have a small cup or bowl if you were out shopping, which my mom and I did at Byerly’s, an upscale grocery store in St. Paul. My sister, who lived in the more cosmopolitan Minneapolis, took me to Cafe Brenda in the 1980s, and this is the soup I came to love. 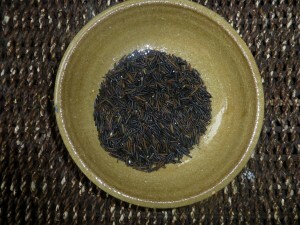 Rinse wild rice thoroughly in a strainer. Bring stock to a boil, add wild rice, brown rice and rosemary sprigs. Simmer, covered, for 1 hour or until rice is tender. While rice is cooking, chop vegetables. Warm the half and half in a saucepan and add the vegetable mixture. Let steep for 5-10 minutes. 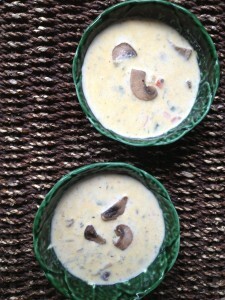 Melt remaining 2 T. of butter and sauté the mushrooms until nicely colored and soft. Add half of the mushroom mixture to the vegetables and half and half. Puree the vegetables in the pot with your immersion blender or pour into a blender and puree. Add the pureed mixture to the rice and stock mixture and stir to combine. 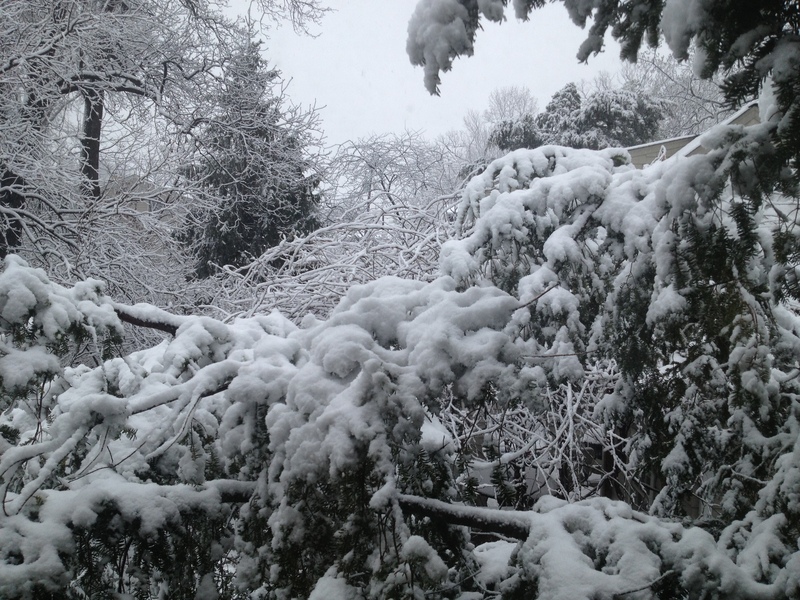 Take out the rosemary sprigs. Add the remaining sautéed mushrooms. Season the soup with Worcestershire, salt, pepper and parsley. Simmer the soup gently, until heated through but do not let it boil. Flavors develop best overnight. The Ojibwe people still harvest wild rice by hand in Northern Minnesota. Photo: White Earth Nation. Anyone with any knowledge at all of French cuisine will scoff at calling this pâté, but I certainly can’t call it “meat dip” and get anyone to try it, now can I? It is very easy and makes a large quantity, so save this to try when you are having a cocktail or holiday party or when you have multiple pot lucks to contribute to. (A little goes a long way to satisfy, and believe me, this dip is rich so you don’t want a large quantity lurking in your refrigerator for days and days after you’ve had your fill.) Share it, baby! 2 T. grated yellow onion (NOTE: it is important that the onion is grated, not minced. 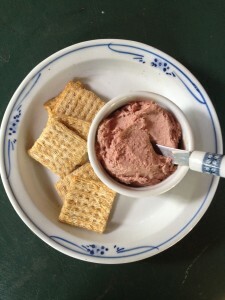 That will give you a wonderful, juicy mush to intoxicate your pâté with. Break out the box grater. 1 tsp. garlic powder (NOTE: I don’t recommend chopped fresh garlic here because you want a perfectly smooth paste without bits of garlic for your guests to bite into on their cracker. Mash the Braunschweiger and the cream cheese with a fork in a mixing bowl until incorporated. Cover the bowl with plastic wrap and refrigerate. You can serve right away but I find that the flavors develop better overnight. Cheers! And enjoy your ‘meat dip’ with a dirty martini or an IPA.